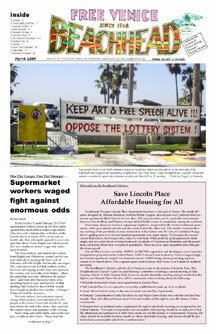 Beachhead Editorial: Save Lincoln Place. Affordable Housing for All. Town Hall Photos - John Davis & Don Geagan, Barbara Eisenberg & DeDe Audet, Ibrahim Butler & Laddie Williams, Arnold Springer & Lydia Poncé, crowd scene. Photos: Lincoln Place sign, Lincoln Place destruction (by Lydia Poncé), Architects of Lincoln Place - Ralph Vaughn and Heth Wharton, 1951 Apartment rental ad. Rick Davidson report in 1969 on "police running wild" in Oakwood. Your Donations Can Save Our Marina Hospital!